I agree with any reductions to the huge isk faucet that is insurance. If you want to talk about isk faucets, maybe CCP should revisit the Encounter Surveillance System deployable that was introduced in Rubicon? After Goons figured out you could just anchor it in one of the horrible anomolies that nobody actually runs, and pop all the triggers so that you have a fleet of scramming rats guarding it for you. It did kind of just turn into a buff for nullsec ratting income while adding none of the risk of theft or interesting gameplay dynamics that it was supposed to add. He does seem rather upset by this completely legitimate use of in-game mechanics in a way that everyone could have predicted beforehand. So the real question is... will T2 prices go back up to the levels they were at 3 months ago? How adversely will this effect alliance SRP programs? Were higher T2 insurance payouts allowing SRP alliances to pocket more isk off of moongoo due to the extra isk injection into the eve economy? 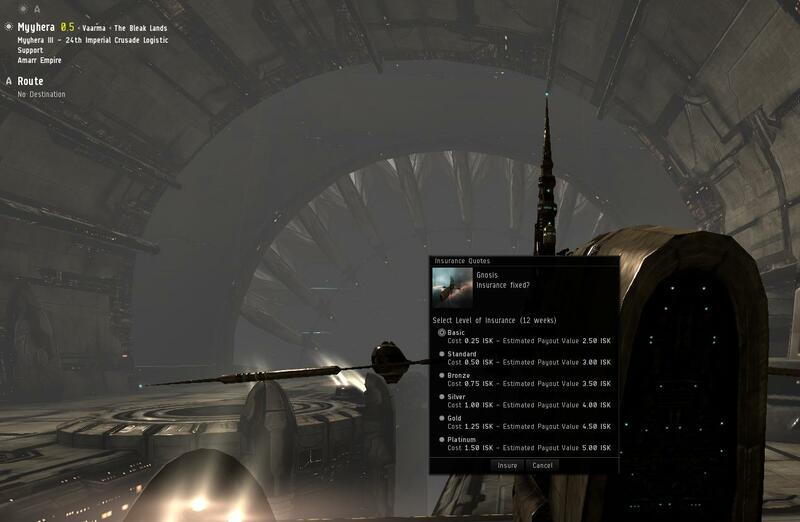 I'd love to hear from a major nulsec alliance on how this is going to effect their isk flow and SRP. Well Brave's Eagle fleet apparently just got 3x more expensive to reimburse. While I think its a sh*t doctrine anyway, it doesn't exactly bode well for their prospects for flying competitive doctrines in the future especially as CCP also rolled back the bomber changes that might have helped their dominixes not get repeatedly bombed off field by an endless stream of 3rd partying bombers turning up to every timer. Nor does it bode well for any other alliance that doesn't already own multiple regions worth of renter space and R64s. So here's to another year of stangnant nullsec, we're not likely to see any new players emerging any time soon. That's pretty much what I'm getting from this, too. With higher insurance payouts, smaller entities could more readily field better doctrines. Unfortunately, Malcanis' Law definitely applies here. Also, if it weren't for OP T3s, you'd see a lot more Eagles. And I'm not upset, I'm just disappointed. But don't worry, because at least the art team knows what they're doing. While I understand this is not a direct change by CCP, I am still extremely disappointed in them. This was definitely one of the more positive changes of late, and now it has be completely reversed. What? Are you saying The Bright Star and/or Jovians are responsible? What would need to change where mandatory insuring of T1 ships (and ignoring T2 lol) is no longer needed? That's why it was actually GOOD. They didn't intend to make the change.. those are the ones they screw up! I don't care one way or the other, but CCP... you think you could could leave SOMETHING alone, or, at least provide some kind of table showing the premium and payout amounts! Some of you will have noticed that insurance payouts for T2 ships have decreased starting today (December 3rd). This is an intentional change, designed to counteract the higher-than-desired increase in insurance payouts that resulted from the Crius industry changes. You should expect insurance payouts for Tech 2 ships to now be a bit closer to what they had been pre-Crius. This change isn't tied to any release since the insurance values recalculate on Tranquility on their own. Today just happens to be recalculation day. you gotta be fcuking shitting me. this was one of the very very few "glitches" in any game I've played that I'd be glad for it to stay. I want all my isk back for all T2 ships that I have insured. Off topic, but, anomalies and wormholes are not stable and static, if you know what you are doing you can make a substantial pile of tags from them. There are also ways to get in and out even with rats circling - of course you wouldn't bother looking at those options just taking the easy :whine: option when you see the words isk faucet in a thread about T2 insurance changes. Morosi aren't T2, so they aren't getting hit by this particular drawdown. The payout will be different on account of the insurance figure being rebalanced, but it won't be significantly lower, like it is for T2 ships. Only took CCP 3 months to say anything about this, despite repeated prodding. Anyone who doesn't appreciate that Insurance currently is a huge ISK faucet doesn't deserve to comment on insurance. The game doesn't have enough ISK sinks as it is. God forbid you actually lose the value of the ship you exploded. Don't fly/make srp plans about what you can't afford to lose/srp. Blowing up a ship isn't an ISK sink, it is a resources sink. Your ISK still goes to another player. The only ISK sinks in the game are the payment for insurance, wardec payments, office payments, and those other things where money goes DIRECTLY to NPCs. Also, the only ISK faucets are from money you get DIRECTLY from NPCs, like mission ISK rewards and insurance payouts. ISK traded between players is NOT an ISK sink. The good part about this is a smaller ISK faucet from insurance payouts for the affected ships. Less free money is good. Insurance is a ******** premise anyways. Sad about this. I didn't fly T2 ships the past few months, but this makes me less likely to undock in one in future in anything other than a large fleet.